Since I was 4 years old, I wanted to get married. Now that I have a 4 year old daughter, I know how weird this is. She wants to marry her friend Jacob, or so she says. He is the only boy for her, but I know this will change over time. She has already been a flower girl once, and is in training for her second rose petal tossing in a few months for one of my best friends. She has a mom who is slightly wedding obsessed and who is now taking courses to become what I think, will be Calgary's best wedding planner. She watches Rich Bride - Poor Bride and Hitched or Ditched with me. My daughter is doomed to be just like me. I have bought wedding magazines, read blogs, gone to wedding fairs, and all with no ring on my finger. I just enjoy the entire process of weddings, from the engagement, the celebratory parties, the photos, the food, the excitement, the crafting of favors, brain-storming for ideas and the overall emotions and excitement that come with "the big day". Numerous friends of mine have gotten hitched in the past few years and I have heard more than once "Oh my gosh Brittany, I think you are more excited than me!" from the bride to be. I started taking Event Management at Mount Royal College this year. I know that no one will trust someone who just gets really excited about weddings to be in charge of one of the most important days of their lives. I want to be able to prove that I am the best, I am capable of doing this and I am the one for them. This is the beginning of my Wedding Planner portfolio. When I get an idea, I want to be able to write it down somewhere, share pictures and ideas. One day I will be planning weddings for a living and my job will be helping two people plan to be together forever, but until then the wedding brainstorming factory is open for business. So to start off, I will explain what my dream wedding is. Let's get this straight, I am not engaged, although my boyfriend Josh (he too, is doomed) have discussed our big day. To get started, we will have our engagement photo's taken at the Calgary Stampede. Fun and whimsical, and we can both dress in our favorite Stampede threads. Anyone who knows me, knows how much I adore this time of year. The Stampede is my favorite event of every year. It is also where Josh and I had our first kiss. We are both born and raised Calgarians, so it is important for both of us to integrate this background into our wedding. It will be in Calgary, at Hotel Arts, no other place will do. The ceremony and reception will most likely all be there, with a poolside reception in between. 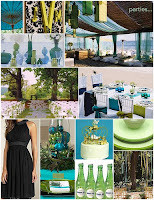 The colours will be reminiscent of our trip to Cabo, light sand, turquoise waters, and lush greens. I know my bridesmaids, as I am very lucky to have sisters and best friends whom I love with all my heart and my day would not be complete without them by my side. I want pictures on the railroad tracks, under the Calgary Tower and at the Saddledome. We will write our own vows and the wedding party as well as myself will walk into the ceremony to the Hawaiian version of Somewhere Over the Rainbow by Israel Kamakawiwo'ole, and I will cry my little eyes out, at least I think I will, I cry at everyone else's weddings. Brooklynn will also be involved in the ceremony and will receive a "family" ring. The reception will be casual, fun, young and modern. I want a feel of a Miami club, warm and dimly lit. Think destination wedding, but at home with all those we love. Lots of candles, lots of food, drinking and dancing. I think both of us just want a great big party. Once the reception has started, I no longer want it to be all about us, but rather all about our families and friends having the time of their lives too. See, told you Josh was doomed.